Art therapy provides a creative way for people to come to terms with emotional conflicts, increase self-awareness, and express unspoken and often unconscious concerns about their illness or their lives. People always ask, “Do I need to be good at art?” and the short answer is NO! Art therapy is based on the idea that the creative act can be healing, it helps people express emotions and reduce stress, fear and anxiety. 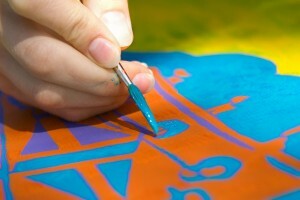 People involved in art therapy are given the tools they need to produce paintings, drawings, sculptures etc. Art therapy is provided individually or in groups.